It's done!!!! You have no idea how happy I am about this. I've been working on this quilt (off and on) since about May. It's for Baby OWL (Olin Winter Leyne), my one-month old grandson! It's not your typical baby quilt, that's for sure. But I was attracted to all the bright colours. When I started it, we didn't know if he was a boy or girl. But I think it works well either way. The back is black and white polka dots! Then came home and hand sewed the binding until 2:30 a.m.!! It is beautiful! And I love the name Olin...very unique. Congrats...on the grandson and the finished quilt. You're a very talented Grandma! Well, the party was totally worth it, don't ya know! Tee hee. Don't ya' just love being a Grandma! It is the BEST! Yes! Being a grandma IS the best! I had no idea. The quilt is gorgeous! I wish I had more time to quilt...Someday! 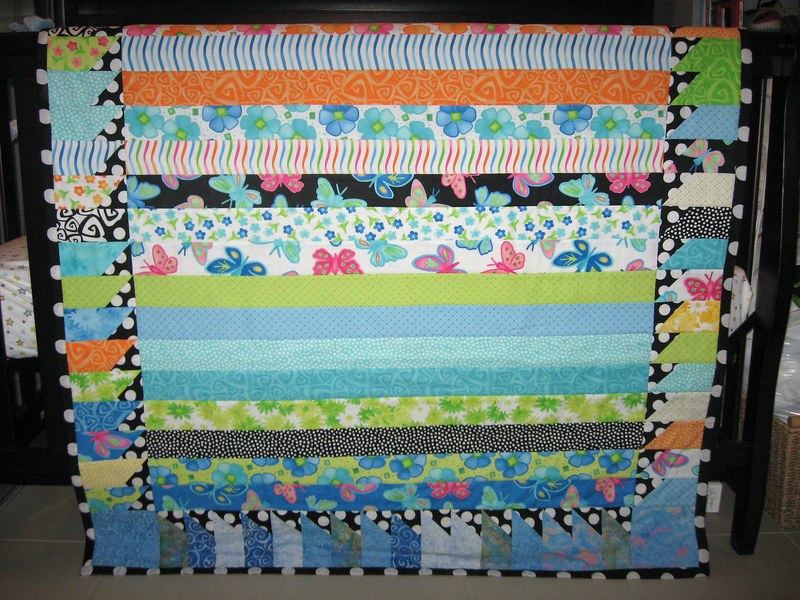 I'd LOVE to see one of your quilts, Kimberley! It is beautiful Barbara! What a wonderful gift for your grandson. Good work! It turned out great. I love the bright colors. The border looks like it took forever, but so worth it. So darling! What a treasure! What a bright and beautiful quilt! It will be treasured! Thank you, Lory, Lori and Heather!! A beautiful quilt. I am sure that the OWL looks extra adorable all cuddled up in a quilt from Grandma.